Do you love patient focused healthcare? Do you want the opportunity to get to know your patients better? Do you like being part of a team that you can count on? Do you want to be part of an organization where you matter and can make a positive difference? 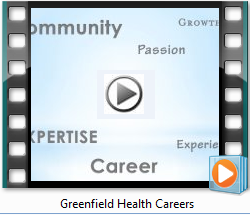 Working at Greenfield Health Systems is about making a difference-each and every day. Come join our team. We’re hardworking, dedicated, and know that what we do makes a difference. We pride ourselves on a culture where safety is number one and where a job well done does not go unnoticed. Our team members are always encouraged to become the best they can be through growth and education. Functions include admission and ongoing assessments of patients utilizing physical and psychosocial assessment skills, diagnostic data, and medical evaluations. Evaluates effectiveness of care provided as related to short and long term patient goals. Develops a plan for patient care including actions in anticipation of individual patient needs. Implements nursing actions and medical orders to meet complex needs of patients and significant others, taking into account their age specific psychosocial and educational needs. Documents care provided and patient responses to care in appropriate forms in the patient's record. Assumes Charge Nurse responsibilities and accountability for care provided by LPNs and non-licensed technical personnel as assigned. Leadership abilities are demonstrated in the following: functioning as a professional role model, consumer relations, communication skills, problem solving, decision making, and assistance in orienting and training personnel.